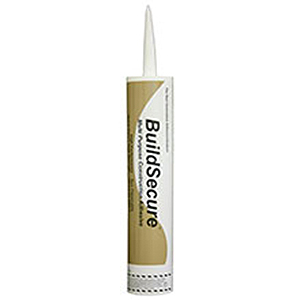 DESCRIPTION: BuildSecure "green" structural adhesive is a fast setting structural adhesive designed for commercial and residential panel on frame assemblies. BuildSecure is 100% VOC compliant, non-flammable and non-carcinogenic. Build Secure adhesive is a high adhesion product which meets specifications for sub floor construction (AFG-01, UM-60, ASTM D-3498) BuildSecure achieves "wood tearing bonds" in as little as four hours. With 500+ PSI shear strength, build secure is ideal for floor decks, shear walls and roof assemblies. BuildSecure is 100% solids. This means build secure can be used on irregular surfaces without fear of shrinking. Quick Curing: Cures much quicker than Polyurethane based products. Especially in cold weather. No solvents or Odors -- Safe to use indoors or in confined spaces (mild ester odor during cure). Available in 10.1 oz tubes or 28 oz tubes. Other packaging in pallet quantities. Newborn Rolling Wheels Set for X-Tender Caulking Gun models 132 and 377. Price/Set.